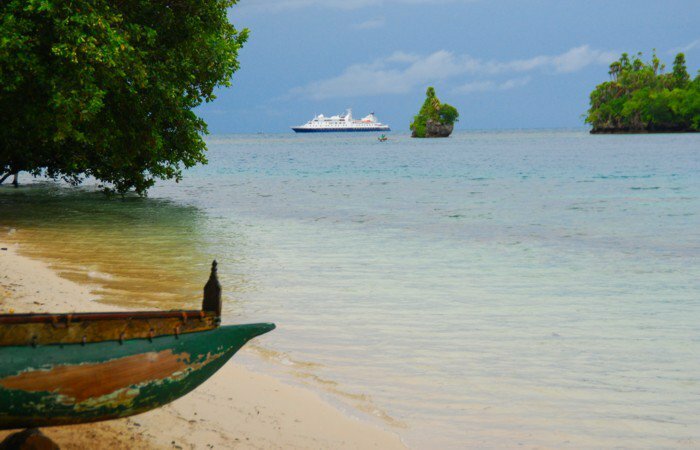 The Tami Islands (Kalal, Wanam & Idjan), in Morobe Province, Papua New Guinea, are as close to paradise as one can find on today’s Earth. Over the last few years I have been fortunate enough to spend a lot of time here and get to know the people, their history and culture. I shared their grief when, just on two years ago, one of their community leaders and chiefs passed away, only a day or two before I arrived back in the islands, and then just a few days ago I got to share their joy when the recently deceased chief’s daughter, Judith, gave birth to a healthy vibrant pair of twins. The circle of life continues it would seem. Only a few days before in my beloved village of Watam near the mouth of the Sepik River, where I honourably sit as one of their chiefs, I arrived to discover my long time friend and associate, in fact one of the people who first took me to Watam, Peter Wali had passed away. Senselessly his death was caused by drinking “Jungle Juice”, or “Steam Yawa”, a potent and obviously deadly home made steam distilled alcohol. I visited the “Haus Krai”, the mourning house, to be met by Peter’s father who was immediately battling his emotions of appreciation at seeing my arrival and his overwhelming grief for loss of his son. We both embraced and broke down crying, the appropriate thing to do at a Haus Krai after all. So to be in the beautiful Tami’s after the shock and dismay at discovering the senseless death of Peter in Watam, was a welcome thing. The Tami Islanders traditionally participated in a sailing trade route, equally as dynamic but far less well known as trade routes such as Milne Bay’s “Kula Trade”, or the Port Moresby/South Coast “Hiri Trade”. The Vitiaz trade incorporated parts of the Madang and Morobe coastlines and coastal islands (such as the Tami’s) and across the Vitiaz Strait to West New Britain. My good friend Daniel, a clan and community leader from Wanam in the Tami’s, is as proud of the traditions of this ancient sailing canoe trade as anyone in the Tami’s today. Earlier this year Daniel had presented me with a small replica model of one of the Tami Island’s style trade canoes once used in this famous trade system. The detail that Daniel had put into this model was phenomenal, with intricate rigging and elaborate decoration. This model joins with several equally as detailed models in my possession, including several awesome Kula Canoe models from the Trobriands. The Tami Islander’s are well known for their wood carving abilities, a Tami Island Bowl is featured on the ten kina note, recognised as a cultural symbol of Papua New Guinea, immortalised on the currency along side shell money and other unique items. Along with the proud trade history, the intricate carving ability many other aspects of traditional Tami Island life still exists today. Traditional dancing, theatre, music and costumes (bilas) are still part of regular life in the Tami Islands. The bilas also reflects the great Canoe traditions with the head dress in the shape of a sea going canoe. So having only a few months ago received the small model canoe I was certainly not expecting another gift when I landed in Wanam Village a few days ago. Daniel greeted me on the beach as I landed to tell me he had a surprise for me. We walked the short distance to his house and found waiting for me a significantly larger replica of a Tami Islands sea going sailing canoe as used in the Vitiaz trade. It had equal the amount of intricate carving and rigging as the small model I received earlier, it was just BIGGER! Well it’s certainly an honour to receive such a wonderful gift, but how can I get it home? Where am I going to put it? Will I ever get it through Quarantine importation?? But I can’t say no, that would be a major cultural insult! I had to take it, there was no question of that. I was going to have to call in some favours to get the canoe home and then take my chance with the inconsistent often contradictory Australian Quarantine officers on arrival. Eventually the canoe arrived home last Tuesday, and as predicted the Quarantine officials had no idea what to do. It took them 4 hours and dozens of phone calls to decide on a course of action. The canoe was fumigated the next morning with methyl bromide and at a cost of $450 to me! It is now sitting in my driveway, I wonder what the neighbours think it is………. No comments posted on this page? We enjoyed the pics! Thanks for posting.